Will stocks keep climbing in 2019? Economic growth and corporate earnings will slow down and inflation will heat up next year, many Wall Street analysts warn. But that doesn't mean investors should sell stocks. 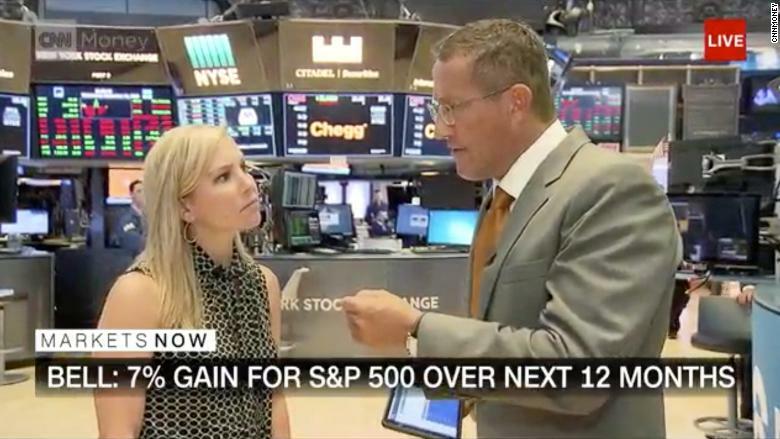 Lindsey Bell, an investment strategist with CFRA Research, told CNNMoney editor-at-large Richard Quest on "Markets Now" Wednesday that in the next 12 months, the S&P 500 will grow by 7%. That's only a slightly smaller increase than this year, she noted. Investors won't get a better deal anywhere else. The yield on the 10-year Treasury note is around 3%. When you tack on 2% inflation, she noted, the real return falls to 1%. "You wouldn't get out of the equity markets at this point in time," Bell said. Investors shouldn't think of 2019 as a slow, sluggish year, she added, but as a period of steady growth. Bell said GDP is expected to grow by 2.7% and earnings by 10% next year. This year, growth accelerated faster on both fronts: GDP grew at an annualized rate of 4.2% last quarter and earnings are up more than 20% in 2018, according to Bell. But most years would look bad compared to 2018 -— a particularly strong year for the economy and corporate earnings. "When you're up against big numbers, it's really hard to get big numbers again," she said. "Markets Now" streams live from the New York Stock Exchange every Wednesday at 12:45 p.m. ET. Hosted by Quest and CNNMoney's business correspondents, the 15-minute program features incisive commentary from experts.